China's vice premier Hu Chunhua has warned that the global economy is moving in the wrong direction. A regional economic forum in Vietnam is analyzing the fallout from the ongoing U.S.-China trade spat. 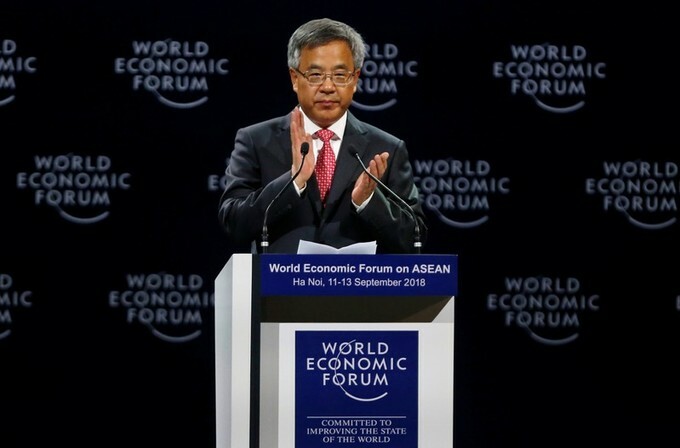 Speaking at the regional World Economic Forum in Hanoi, Vietnam, China's Vice Premier Hu Chunhua said the Southeast Asian countries must support multiculturalism and reject unilateral trade policies. "Some individual countries' protectionist and unilateral measures are gravely undermining the rules-based multilateral regime, posing a most serious hazard to the world economy," Hu said Wednesday, in an apparent reference to China's ongoing trade dispute with the U.S.
"We must categorically reject protectionism and unilateralism, firmly support multilateralism, and uphold world economic and multilateral trading regime," he added. Earlier this year, the Trump administration imposed steep tariffs on steel and aluminum from key trading partners, as well as punitive duties on $50 billion in annual imports from China, with the possibility that another $200 billion will be imposed soon. China's Ministry of Commerce said last month that it had held "constructive meetings" with U.S. officials after talks resumed between the countries over the trade spat. The resumption of talks, however, did not prevent an additional $16 billion of tariffs being levied by the U.S. and China on each other's goods. Countries in Southeast Asia, whose economies depend heavily on China and the U.S., are closely watching the tariff dispute between Beijing and Washington. But economic experts say the U.S.-China trade conflict is likely to boost Southeast Asian economies in the short term. Several Chinese firms have already moved their production to regional countries in a bid to avoid U.S. tariffs. "ASEAN (The Association of Southeast Asian Nations) countries don't want to count their chickens before they hatch," Fred Burke, a managing partner at multinational law firm Baker McKenzie's Vietnam offices, told AFP news agency. "But I think they see it on a net basis as a gain for them because it means shifting manufacturing into Southeast Asia that was... (earlier) in China," he added. But Rajiv Biswas, Asia-Pacific chief economist at IHS Markit analytical firm, says the region is "very export-driven.... so any shift toward more trade barriers... is not good." ASEAN trade grew by a value of nearly $1 trillion between 2007 and 2014, according to the World Economic Forum, as the 10-nation bloc has enthusiastically embraced trade liberalization — in contrast to U.S. President Donald Trump's policies. Southeast Asian countries are also looking for stronger regional economic alliances to counter Trump's protectionist measures.